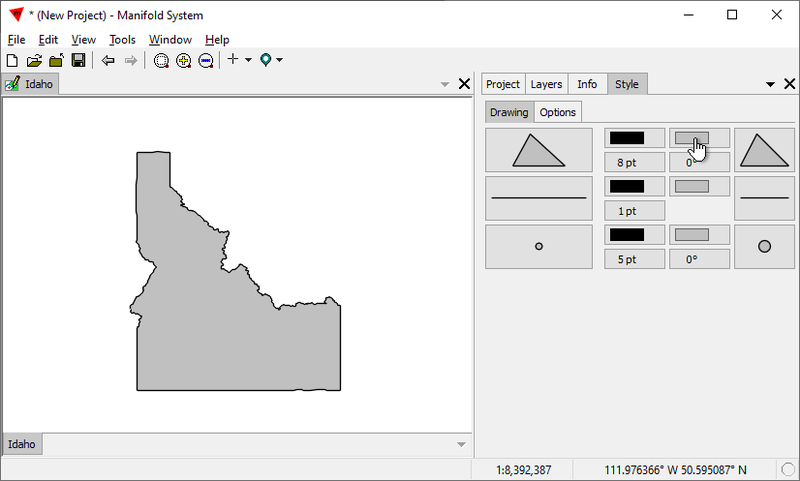 In this example, we show the step by step process to import a shapefile and to create a map. 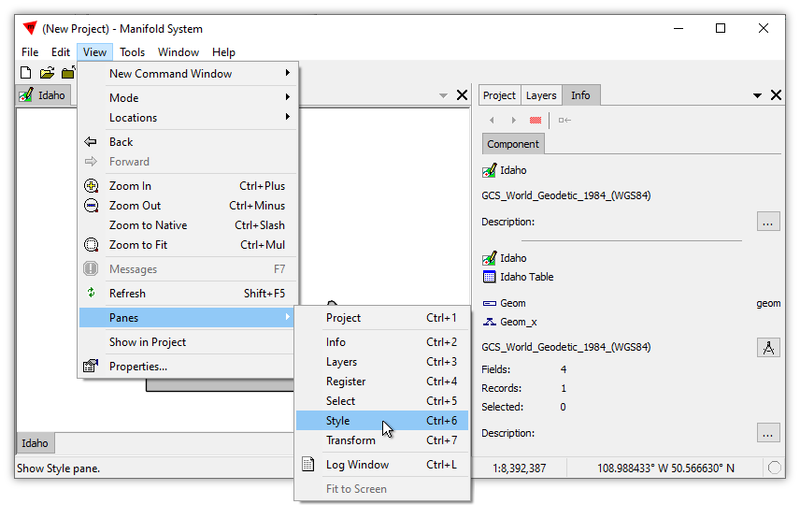 Launch Manifold and choose File - Import. Navigate to the folder desired and click on the .shp file desired, and press Import. 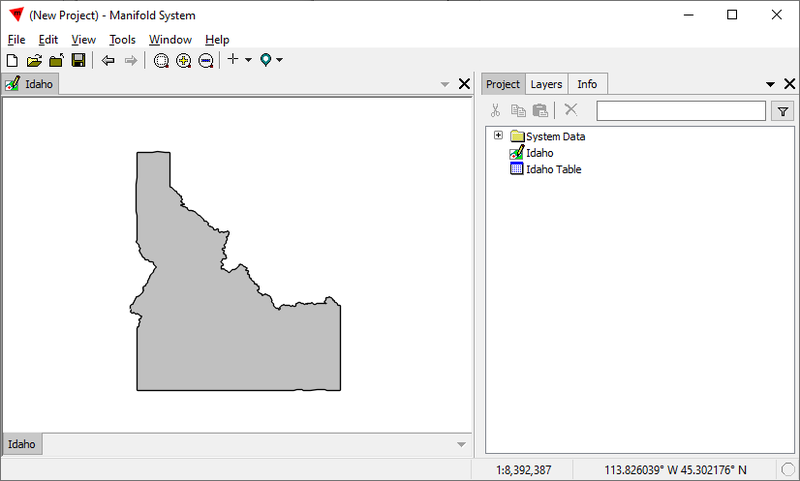 See the SHP, Shapefiles topic for more on the multi-file ensemble that comprises a "shapefile." A new drawing called Idaho and a new table called Idaho Table are created in the Project pane. Double-click the Idaho drawing to open it in a drawing window. Experienced GIS uses will recognize the horizontally spread-out look of a Latitude / Longitude projection. To see what projection is used, we can click on the Component panel of the Contents pane. The panel reports that Latitude / Longitude coordinate system is used. We can do better than the default gray formatting for Idaho. In the pull-down menu we choose the Style panel. In the Style panel we click the Fill color properties button for areas. The buttons are not captioned since everyone working with Manifold after the first few minutes knows what they are, based on the area, line and point symbols that appear. In the pull down menu we choose the medium orange color shown. The fill color for the area immediately redraws using that color. 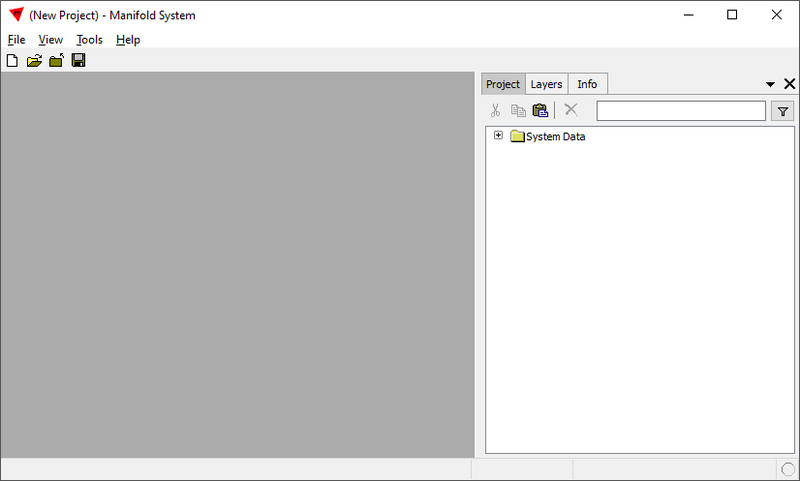 So far, we have displayed the imported drawing in a drawing window. If we like, we can display it in a map window. 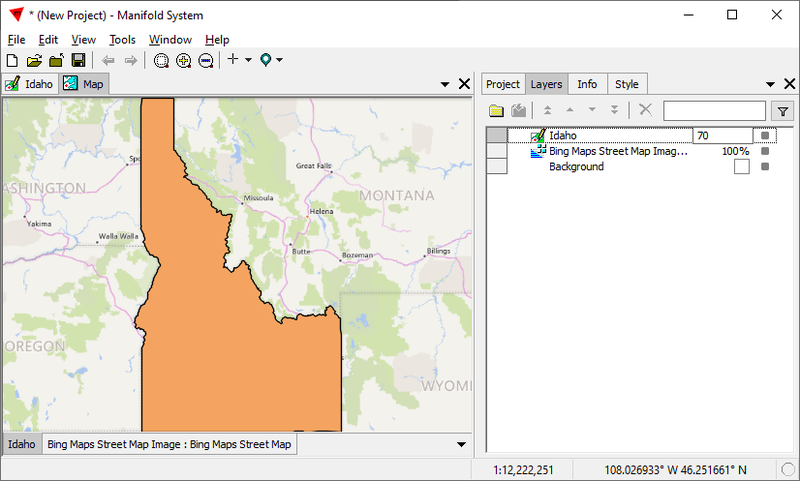 We right-click into an empty space in the Project pane and choose Create - New Map. 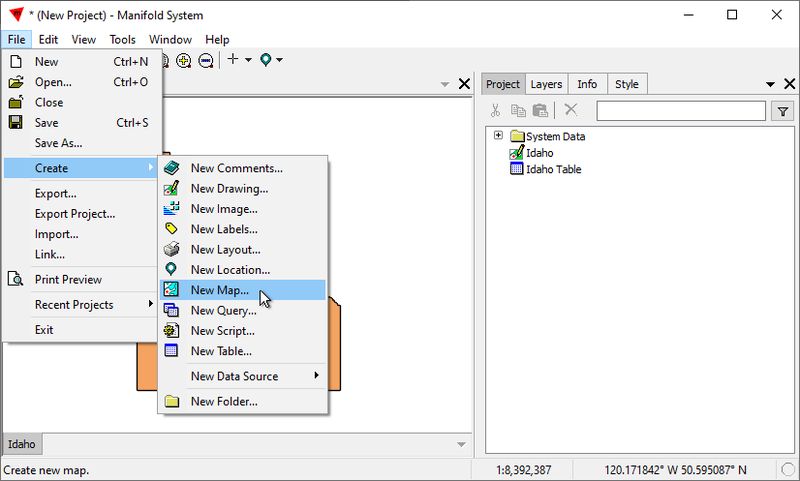 In the New Map dialog we leave the default name Map and press Create Map. 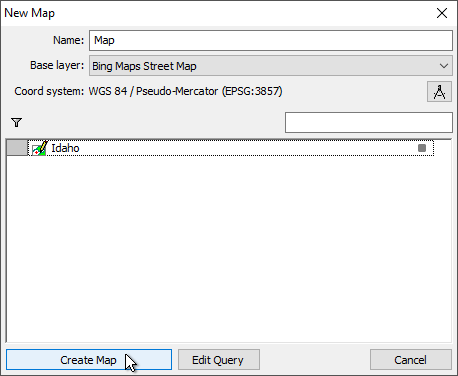 ...New Favorite Data Source, and then we choose the Bing Maps Street Map data source. Manifold provides some of the most popular web server data sources as default Favorites, so we can choose them with a single click. We double-click on the Map to open it. It opens as a blank window. 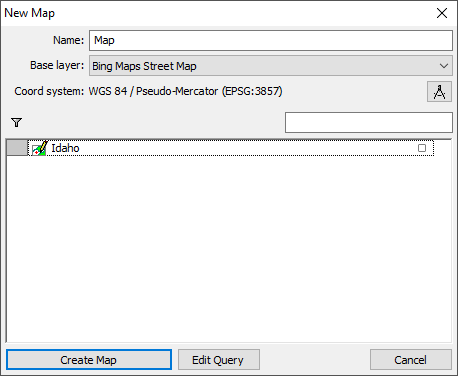 To add the Bing layer, we expand the Big Maps Street Map data hierarchy, within which we will see the Bing Maps Street Map Image component. 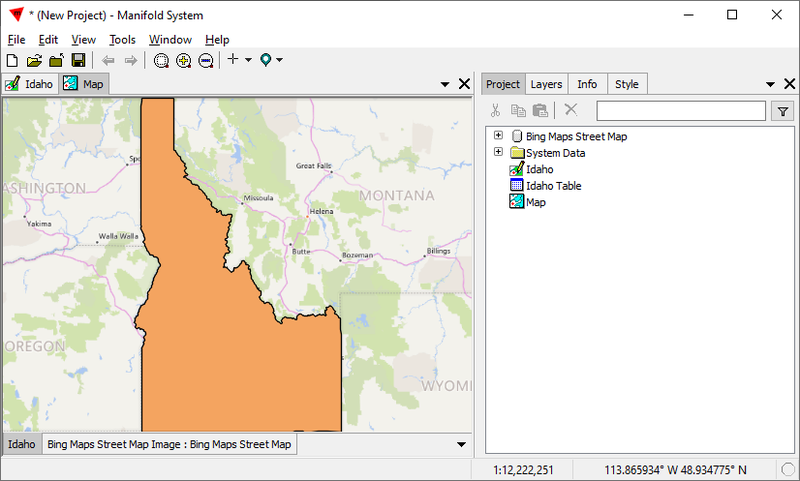 We drag and drop the Bing image into the map. It appears as a layer showing the entire world, the full extent of the Bing web served imagery. Map windows automatically take their projection from the first component dragged and dropped into them. 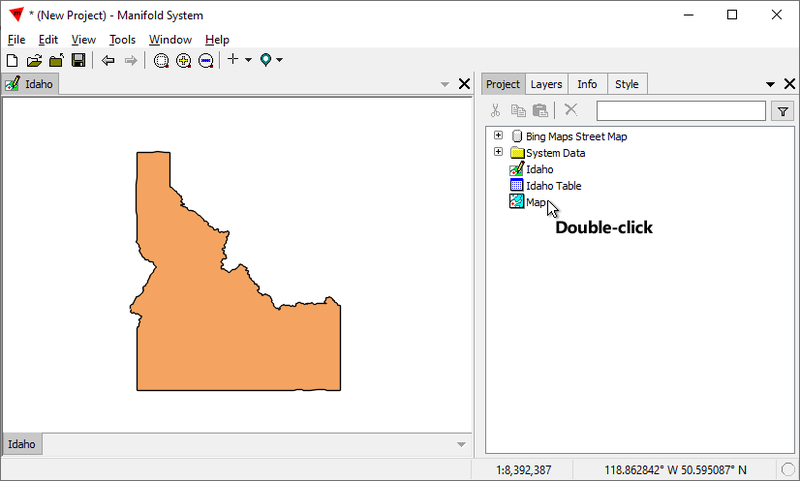 The Bing web server uses Pseudo-Mercator, so that is what the map window will use. Next, we will drag and drop the Idaho drawing inot the map. Idaho appears as a tiny figure within the whole-world display. 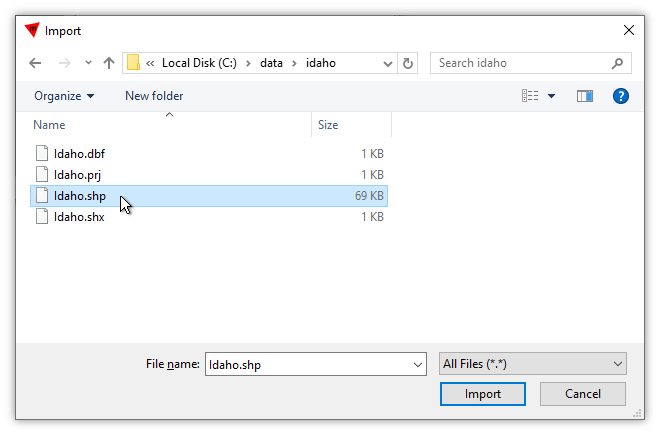 We Ctrl-click on the Idaho layer tab to zoom to fit that layer's contents. See the Manifold 9 - Incredibly Convenient Zooms video to see more examples of ctrl-clicking on a layer tab for a very fast zooms. 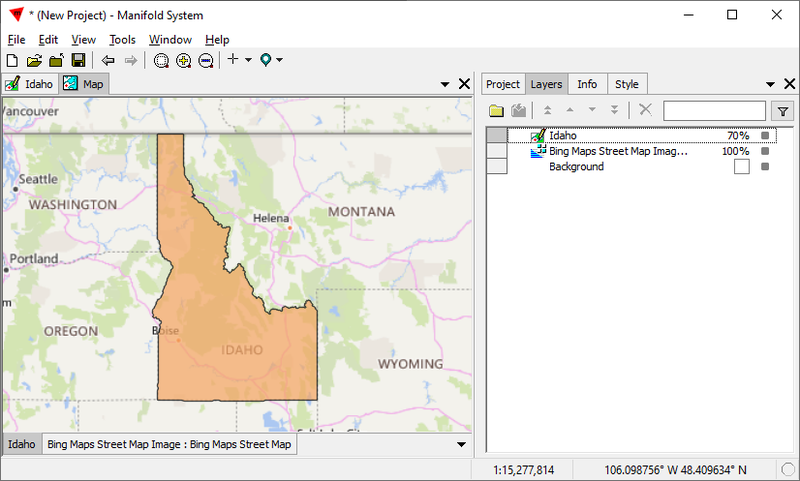 The display immediately zooms to fit Idaho, with the background layer automatically filling in details from the Bing web server. 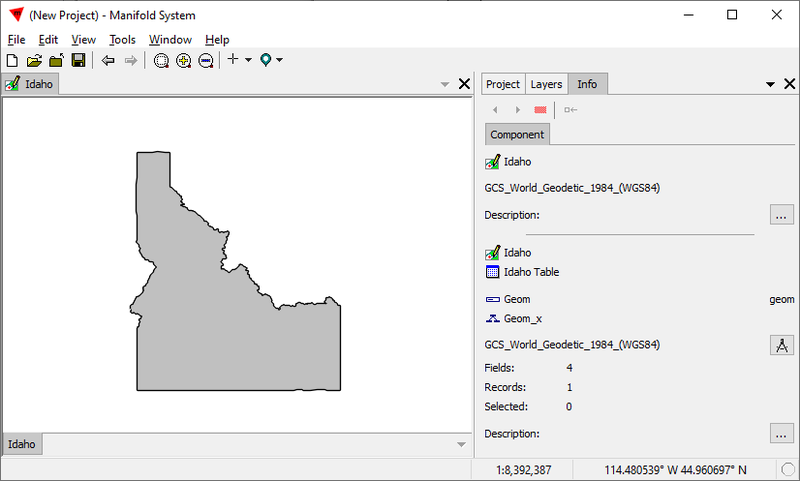 The Idaho drawing is in Latitude / Longitude, but it is automatically re-projected on the fly into Pseudo Mercator to match the projection used by the map window. Fro a more appealing display, we use the mouse wheel to zoom out one click of the mouse wheel, and then we choose the Layers panel and double-click into the opacity value for the Idaho layer, to change it to 70. 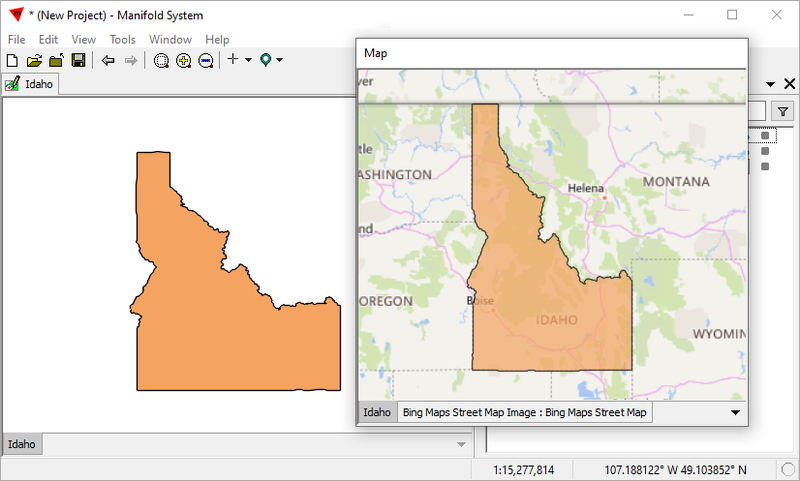 The result is a partially transparent Idaho, which lets some of the Bing background layer be seen. This is a subtle effect that provides better visual context for some people than a completely opaque area for Idaho. We Alt-click the Map tab to undock the map window. We can move the undocked map window around on our Windows desktop and resize it as we like. Many Manifold users will work with two or three monitors so they have a large Windows desktop, and many prefer to undock their map windows and arrange them on the big desktop, so they can see multiple windows at the same time. In the illustration above we can see how the same Idaho drawing is simultaneously seen in its own, native Latitude / Longitude projection in a drawing window even as it participates as a layer in a map window that uses Pseudo-Mercator projection, the Idaho layer being re-projected on the fly for display purposes into Pseudo-Mercator. Example: Edit a Shapefile In Place - How to edit a shapefile "in place," that is, leaving the data in the shapefile and only linking it into a project and not importing it into the project.